And the solar company constructing the array is trying something unusual to appease people who don't want to see rows of panels from their backyards. It's installing flowering bushes to serve as a buffer and to provide food for the island's bee population. "The intent is to screen some of the sight lines that may be of concern," said Daniel Montante, president of Montante Solar, a co-developer and the project's construction contractor. Grand Island is trying to dive into solar power, with town officials saying it's a form of clean energy, will create jobs and can boost the island's reputation for innovation. The Town Board two years ago approved a solar energy law intended to open up undeveloped land on the island for solar farms. 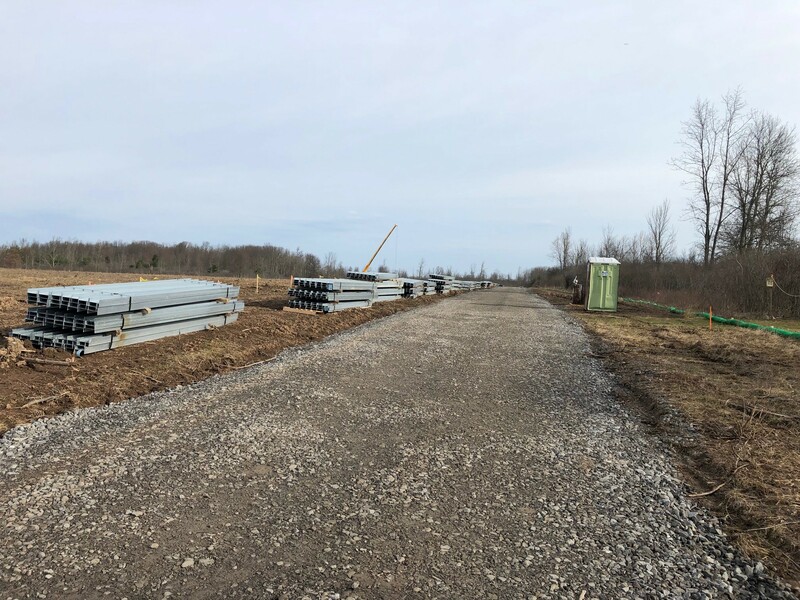 Today, the site work taking place at the Whitehaven Road property and a second location near the Niagara Thruway is the first sign of progress toward the town's solar vision. "We're doing everything at Town Hall to make sure we dot the I's and cross the T's on this," said Deputy Supervisor James Sharpe, "because we know, once they're in, they're in for 50 years." The Town Board passed a solar energy law in February 2017 after about a year of debate and with the strong support of Supervisor Nathan McMurray. The law set minimum size and set-back restrictions for solar arrays that provide power to the public electric grid and set less-stringent rules for solar equipment designed for an individual home or business. Initial interest from developers centered on two sites. The largest of the two projects is at 1611 Whitehaven Road, just west of Stony Point Road. The co-developers are project owner BayWa, SolarPark Energy and Montante Solar. 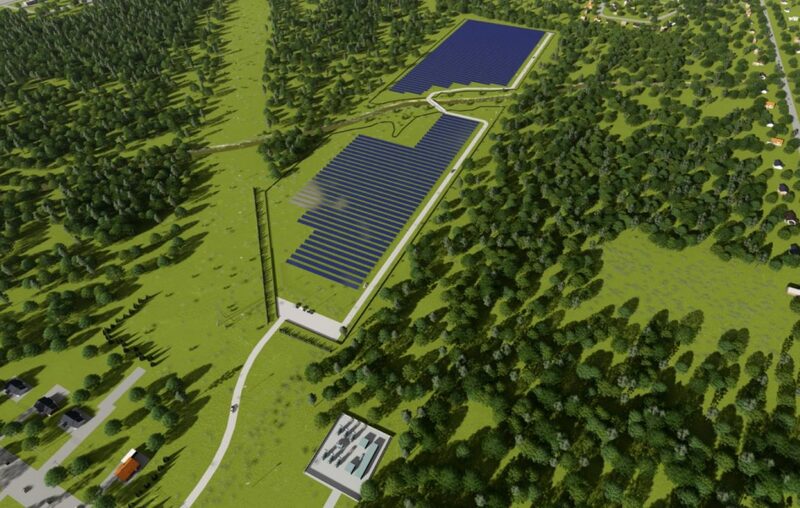 They plan to install 20,100 solar panels in rows roughly running east-west on the site, divided in two. A bridge running over a creek and wetlands in the middle of the parcel will connect the halves. The project would produce 7 megawatts of electricity. The Town Board in July approved a special use permit for the Whitehaven Road project, dubbed SolarPark2, and determined the development would not harm the environment. That vote followed a public hearing attended by one dozen neighbors who objected to the construction of the solar array, according to John R. Tripi Jr., arguing it isn't consistent with the neighborhood and it will bring down their property values. Tripi said he's lived in his Whitehaven Road home for 35 years. He said he's concerned about glare from the panels and he doesn't think the developers will properly screen the property from residents' view. "Solar's great," Tripi said, but not in a residential area. He said he'd rather see houses built on the property. In August he filed an Article 78 petition seeking to overturn the Town Board's decision. The town has not made a formal response but representatives for Tripi and the town have sought to work out a compromise. Notably, Sharpe said, the developer has agreed to put up flowering bushes and shrubs along the project fence line most visible to neighbors. The developers also are planting the flowering bushes between the rows of solar panels, Daniel Montante said. The developers can't plant trees because they can grow too high and produce unwanted shade, but the flowering bushes won't reach much higher than the panels and will offer pollen for bees. "The farmers are loving it," Sharpe said. "The conservationists love it." And, he said, the panels are satin so they shouldn't produce much glint or glare. Tripi isn't satisfied. He said he'll seek a reduction in his property taxes as soon as the array is finished, and he'll start looking for a new home. "I'm definitely going to move. I don't want this in my backyard," Tripi said. That isn't too far in the future. The developers are about to install the bridge on the site and soon will begin driving piles into the ground to hold the solar panel racks. Construction should take four months or so, said Montante, who declined to provide the project's cost. Electricity generated there will go into National Grid's electric network and be available to members of the community, Montante said. It could generate enough electricity to power 700 to 1,000 homes. The other solar project that received approval on the island actually came up for review first and spurred the town to develop its solar law. This project also would provide community solar and involve the installation of about 13,000 solar panels on an 18-acre site, with 411 Bedell Road to the south and 126 Industrial Drive to the north, according to Frank McCleneghen, president of Active Solar Development and Grand Island Solar. McCleneghen said in June 2017, after receiving Town Board approval, that construction on the $7 million project could begin in a few months. Since then, little activity has taken place beside clearing a good portion of the site and putting in a short gravel road. McCleneghen did not respond to a message seeking comment on the project's status. Sharpe said Active Solar also is dividing its site into two pieces, with site work beginning on the portion closer to Bedell Road first. The Active Solar development hasn't stirred up the same controversy because it's in a less-residential area, near a few businesses and the Niagara Thruway. "This whole area is zoned commercial," said Rod Reisdorf, owner of the Mr. Best Wrench repair shop on Bedell Road. He said he thinks solar is a good concept and he'd like to see the project completed. SolarPark is interested in building on two other sites in the town, Sharpe said, though both developments are still in the early planning stages. One 40-acre site is behind the Fuccillo auto dealerships on Alvin Road, and the other 54-acre site is off Bedell Road.